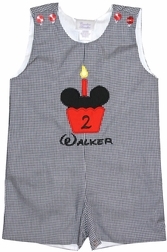 Cute Mickey Mouse birthday outfit for boys. 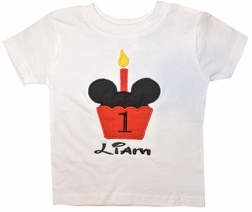 It is perfect for a Disney birthday party or for him to wear if he is in Disney World on his birthday! 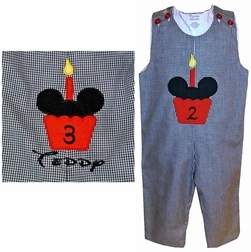 The John John is made of black gingham and is appliqued with a Mickey cupcake and candle. The Shorts set is made with red gingham shorts and a white shirt appliqued with the Mickey cupcake. Add a monogram for extra flare.